For some riders, biking is a seasonal pleasure restricted to sunny weather and summer track days, but for others it’s a year-round labour of love. With our winters becoming a lot more harsh with snow, ice, rain and foggy weather, it’s extremely important that you remain as safe as possible on two wheels. So if you’re committed to staying on two wheels through the cold winter months, how best to cope with the greasy roads and sub-zero conditions? With a predicted La Niña event looming, here are Devitt’s top 10 tips to not just survive but actually thrive when the temperature plummets. And don’t forget, if it’s all too much then you can always opt for a different mode of transport – safety first! The meat and potatoes of your winter riding gear should be a decent jacket and pair of trousers, supplemented with thermal tops and leggings on really cold days. Keep your body’s core as warm as possible and your less well-protected extremities have a fighting chance of keeping the cold at bay for longer. There’s a huge range of textile outfits available, but ensuring a proper fit – not too tight, not too loose, arm and leg length just right when you’re sitting on the bike – is just as important as the water-, weather- and crash-protection qualities. High-cut bib and brace trousers offer the best defence against the cold by keeping your torso better insulated and helping prevent draughts around your waist. Throw in a heated vest and you could end up being warmer on the bike than off it. If you prefer the security of leather over the superior weather protection of textiles, then an unlined one-piece oversuit can provide a decent degree of insulation. They can be a pain to get on and they’re hardly the last word in style but you won’t get any draughts around your waist and nothing does a better job of keeping the rain out. Is your bike ready for winter? It’s going to take a hammering from the elements so give it a good clean and treat it to a corrosion-inhibiting spray, such as ACF-50 or Scottoiler’s FS 365. Make sure the levers and controls are properly adjusted and lubricated, particularly the throttle cable and twistgrip. Most importantly, are your tyres up to the job? They need to be suitable for cold- and wet-weather use, with a broad tread pattern and a high silica content. Semi-slick summer track day rubber won’t do. 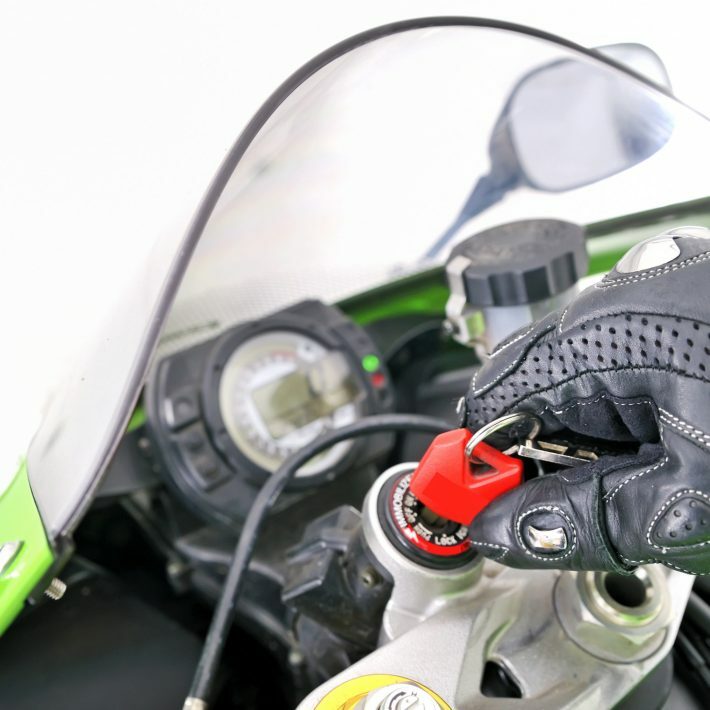 If you have to touch anything cold to get your bike ready to go on a cold morning – a lock and chain or a garage door handle, for example – do it wearing gloves. If your riding gloves are too bulky for fiddling with keys and padlocks, keep a thinner pair handy. It might mean a few seconds more faffing about, but touching cold metal with bare hands will chill your fingers in seconds. If you start your journey with cold hands, they’re only going to get colder, so do everything you can to keep the frostbite at bay. Painfully cold, numb fingers are the bane of the winter motorcyclist. 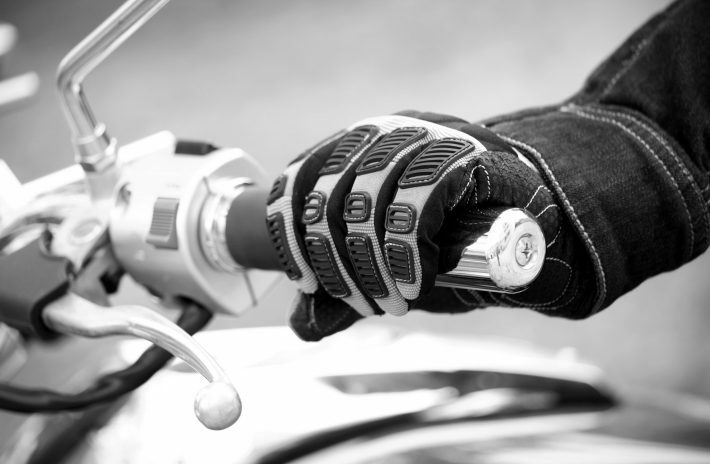 Heated grips or heated gloves can be a godsend, and once you’ve tried them you’re unlikely ever to look back. Some bike manufacturers fit them as standard or offer them as accessories, but if you’re fitting aftermarket items yourself, make sure they’re properly wired in so you don’t kill your battery or set fire to something. If you don’t go down the electrical route, buy the best winter gloves you can afford. Make sure they’re not so bulky that you can’t operate the controls properly, and ensure you can get a good seal around your jacket’s cuffs. Failing that, you could throw fashion to the wind and fit handlebar muffs (although off-road-style hand guards look quite cool and keep the worst of the wind chill off). Keep your toes warm too! Your feet are the forgotten heroes of winter riding, left quite literally out in the cold but with important jobs to do. Winter boots and socks will keep your toes cosy up to a point and heated insoles are available (remember to unplug them before you get off, though), but if you cram too much extra kit into your boots along with your feet, you could end up restricting both movement and blood flow, which will defeat the object. You can delay the onset of permafrost in your socks by riding as much as possible with your toes resting on the footpeg. Ride with the arch of your foot on the peg and your toes tend to stick out at an angle into the windblast, which isn’t ideal! Neck warmers are a must have! Make sure the gaps around your neck, cuffs, waist and ankles are properly sealed. Leaky cuffs can direct cold air and rain up your sleeves or down into your gloves. Some combinations of jacket and glove seal best with the jacket sleeve done up over the glove rather than tucked under it, so experiment to find out which works best for you. 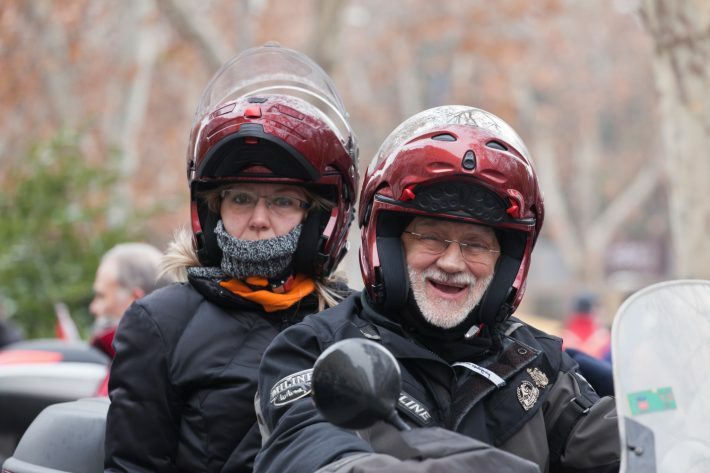 Neck warmers are essential, not only for keeping your exposed neck warm but also for ensuring a good seal around your jacket collar and under your helmet. There are dozens on the market, so find one that bests suits you. Just make sure it doesn’t restrict your head movement or block the airflow under your chin so much that it causes visor misting (see below). Visor misting can be a real problem in winter, so visor maintenance needs to be a daily ritual. There are sprays and wipes on the market to help prevent misting but you’ll need to apply them regularly. Anti-misting inserts such as FogCity and Pinlock work very well provided they’re properly fitted. 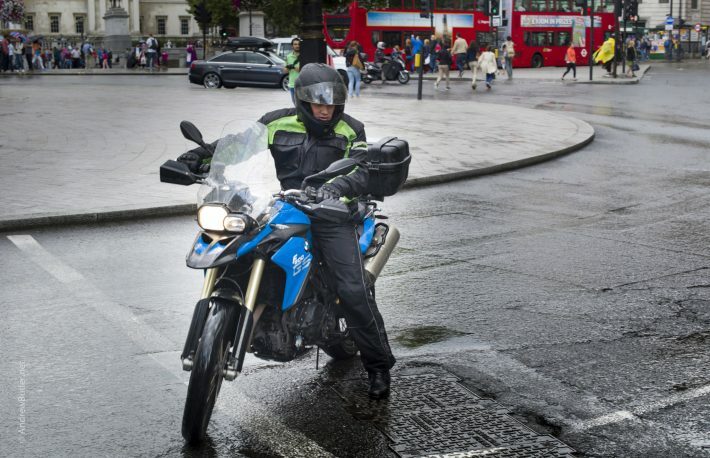 They can also be compromised if the inside of the visor gets wet, so if it’s raining you need to keep your visor closed at all times – which can cause problems if you wear glasses under your helmet. Smoothness is key on cold, greasy roads. In low-grip conditions jerky, nervous inputs will be mirrored in your bike’s reactions, which in turn are likely to make you feel even less secure and confident. It’s a downward spiral. If your bike has switchable traction control, you can sit back and let your ECU do the hard work on slippery roads. For the rest of us, good throttle control is vital. Smoothness is crucial. Snap the throttle open and you’re likely to break traction; instead, wind it on progressively, with your throttle position always matching engine revs. There should be a direct correlation between throttle position and engine response. 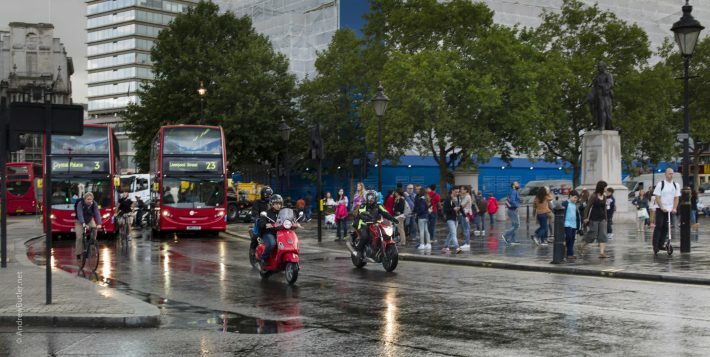 On big bikes especially, don’t be tempted to crack the throttle wide and wait for the revs to catch up – if the wheel does start to spin it will continue to do so even as you’re rolling the throttle off. It might only be for a fraction of a second but that could be enough to put you on your ear. While road salt prevents ice forming – at least to a point – it draws moisture out of the air and creates a slimy film even if no rain has fallen. Manhole covers, white lines and cat’s eyes become even more slippery than usual, so look well ahead to avoid them and don’t target fixate. If you can’t avoid something extra slippery, ride over it on a neutral or positive throttle; panic and snap the throttle shut and you’re more likely to lose the front end. Freshly fallen snow can actually provide a modicum of grip (don’t try getting your knee down, though), but all bets are off once it’s compacted into ice. If you do find yourself riding on ice then don’t be tempted to ride with your feet dangling down to catch a slide. The chances are that you won’t be able to stop the bike going down and you’re risking breaking an ankle or two. Modern ABS has done away with concerns about locking a wheel, but riders of pre-ABS bikes will have to be more circumspect. Again, smoothness – that word again – is everything and most crucial during the initial application of the brake. In fact, it begins with closing the throttle before the brake is applied, because even the sudden forward weight transfer of a snapped-shut throttle can unsettle the front on a slippery road. Once the weight has been transferred forward you can add more braking force – but only up to a point. If it’s too much, leave the bike at home! If the weather gets really arctic then sometimes the best option is to put the bike away, put the kettle on and put your feet up until the spring – and we won’t think any worse of you for doing that.